John Brannen give his coach some final words of advice before the Norse face Earlham in the first game of the season. The NKU men’s basketball team collected three awards from the Horizon League on Wednesday. Sophomore Drew McDonald was named to the All-Horizon League first team, while freshman Carson Williams was named to Horizon League’s all-freshman team and head coach John Brannen was named the Horizon League coach of the year. McDonald, a Cold Spring native, finished the regular season with 10 double-doubles, a team-leading 16.5 points and 7.6 rebounds per game. McDonald was voted to the first team by head coaches, sports information directors and media members. Williams averaged 10.6 points and 5.9 rebounds per game and started all but one game in his freshman season with the Norse. He collected four freshman of the week honors throughout the season, more than any other freshman in the conference. Despite being picked to finish seventh in the Horizon League preseason polls, Brannen turned a team that won nine games last season into a 21-win team, the second best turnaround in the country behind Minnesota. 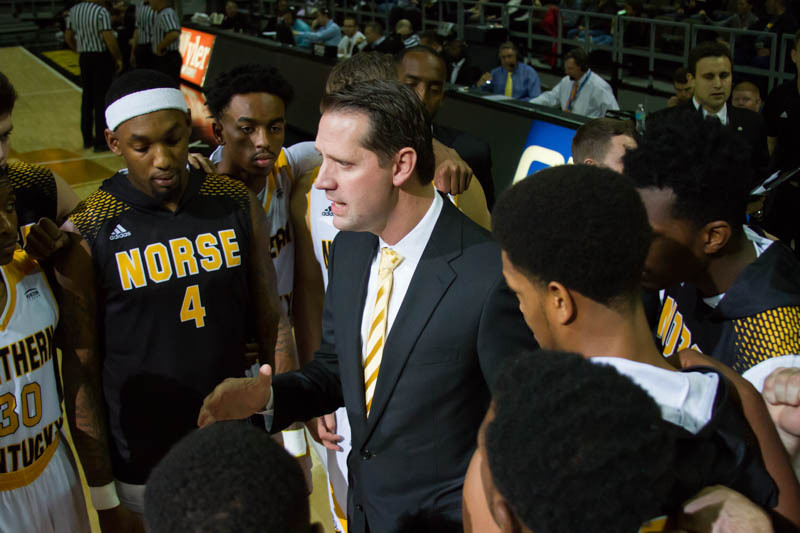 Those 21 wins are an NKU Division I-era record and have helped the Norse move to no. 102 in the NCAA’s RPI rankings. Not only did Brannen lead the team to wins, he has the Norse playing their best basketball of the season at the right time, winning nine of their last 11 games. The Norse are the 4 seed in the 2017 Horizon League men’s tournament, and will playing Wright State on 7:30 p.m. Sunday at at Joe Louis Arena in Detroit. The game will be streamed on ESPN3. The women’s postseason awards were announced on Tuesday, with senior Rebecca Lyttle being the only Norse player receiving an award. Lyttle was named to the Horizon League all-defensive team after leading the Norse in blocks and defensive rebounding per game. Lyttle was also second on the team in steals. The Norse are the 7 seed in the 2017 Horizon League women’s tournament and will play 10 seed UIC in the opening round on noon Friday at Joe Louis Arena in Detroit. The game will be available to watch on ESPN3. Editor’s note: The Northerner had a vote for several of the men’s awards, including first and second team all league, all-freshman team, player of the year, freshman of the year and coach of the year.